Manila, Philippines – After an intensive screening process and rigorous deliberation, twenty (20) individuals were identified to have created remarkable contributions and impact on eradicating the HIV and AIDS epidemic in the Philippines and Asia. Officially called as Ripplers, these individuals were nominated by the HIV-AIDS advocacy community and deliberated by top caliber HIV practitioners and advocates who sat as panel of judges. Out of the top Ripplers, ten (10) of them will be honored and vie for the pioneer Ripple Awards for their outstanding efforts and initiatives. Judges of the Ripple Awards include a UNAIDS and a World Health Organization top officials. 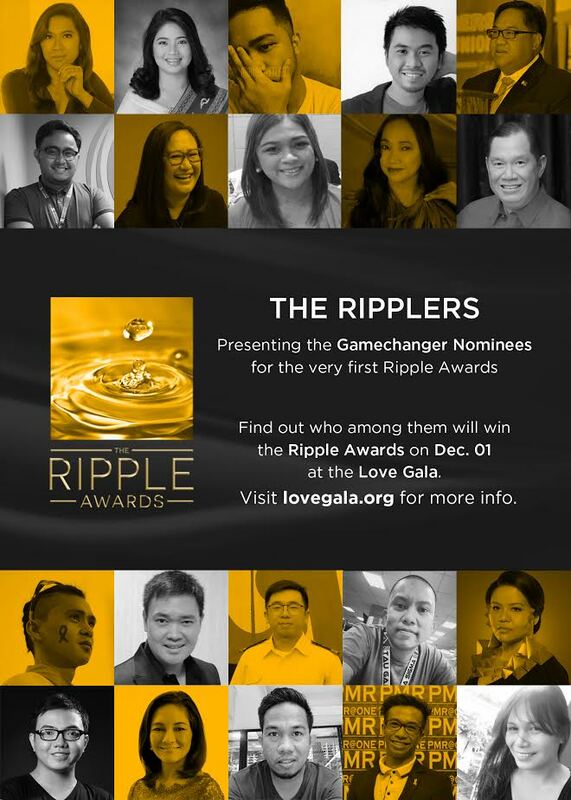 The Ripplers are chosen based on their contributions to their respective sectors which largely help improve the landscape of the entire advocacy. Faustine Luell ‘Paji’ Tupas Angeles (PLHIV, Youth): This 29 year old sports enthusiast and social media influencer founded the Pedal for HIV in 2015 as a vehicle to spread awareness. Paji used his passion for sports to promote HIV advocacy and reduce stigma towards people living with HIV through cycling and running events. He is also a member of the International Aids Society, a community of scientists, advocates and policy-makers revolutionizing the global AIDS advocacy. Sherwin Baniqued (PLHIV, NGO, Youth): Sherwin is a selfless young individual who left his job to devote himself for the HIV advocacy. He established the Juan Posi+ive Movement in Pampanga, which caters to education, treatment, care and support to people living with HIV and their affected family members. He is also a life coach at the Department of Health-Region III. M.A. Buendia (Influencer, Media & Advertising): This BPO agent literally uses the airwaves to increase his listener’s HIV awareness as he anchors the advocacy talk show, Call Center Radio that airs every Sunday morning on DZRJ 810AM. M.A. also takes advantage of the online platform (i.e., Youtube, Facebook and Twitter) to influence netizens about the HIV advocacy. Apart from creating video blogs and other contents, he also gives motivational talks in different schools, universities, and organizations. Billy Santo (Government): A survivor from AIDS complications, Billy devoted his time and effort as the National HIV Ambassador of the Project Red Ribbon. This young man works as a site implementation officer at the Bernardo social hygiene clinic in Quezon City. He is also a writer for the Camadas Online HIV magazine in Positivelite.com and heads a support group of PLHIV dubbed as Bi Positive. Mark Joseph Mamplata (Influencer, Youth): He may hide his true identity behind his alter account on Twitter, but this social media influencer uses this platform to promote HIV awareness and encourage his followers to take an HIV test. He is also active in various online and offline HIV campaigns. Tanya Laguing (NGO): Aside from being an HIV counselor and peer educator, Tanya is currently the president of Decent Image of South Signal Association (DIOSSA). In its humble beginnings, Tanya’s organization started by hosting gay beauty pageants that promoted HIV awareness and encouraged the elimination of discrimination among the members of the LGBT community. One of the unique program of DIOSSA is the “parlor-to-parlor attacks,” where advocates visit salons to educate stylists about HIV and AIDS. Jebsen Rederri Go Gamido (PLHIV, NGO): A professor and breadwinner of his family, Jebsen, together with his 8 co-founding members, established in 2015 the Positibong Marino Philippines, Inc. (PMPI). As a network of PLHIV seafarers in the Philippines, PMPI endeavors to promote a coordinated and unified response and initiative on various advocacies for PLHIV seafarers, their affected families, and the maritime industry. It defends the rights of PLHIV seafarers who find difficulty in getting employment due to their HIV status. Gilbert Yang (Academe, Medical): Dr. Yang is a dermatovenereologist who specializes in sexually transmitted infections, including HIV. He won the Dangal ng Bayan award of the Civil Service Commission in 1995 for his works in leprosy and infectious diseases. As a prominent member of different medical societies, Dr. Yang has come up with an STI/HIV-AIDS modular training program to train doctors in this field. He also authored locally produced biology textbooks that talk about STI and HIV-AIDS. He has served as the only Filipino lecturer in Thailand’s STI Diploma Course to train doctors in STI and HIV-AIDS. David Lozada (Media & Advertising): David is considered a goliath in online journalism, enabling readers to know the stories of marginalized communities. As a Rappler correspondent, he gave light to the HIV epidemic in the Philippines through his writings. David is one of the proponents of the #StayNegatHIVe campaign that won several recognitions abroad. Diday Alcudia (Media & Advertising): Diday is a strategy planning director for an advertising agency that formulated the #StayNegatHIVe campaign. Because of this campaign, HIV awareness efforts in the country was recognized internationally. Enrique Tayag (Government): The spokesperson and dancing doctor of the Philippine Department of Health, OIC-Assistant Secretary Tayag is a public health expert, particularly on “epidemiology” that covers topics on sexually transmitted infections. He has been actively involved in developing policies and guidelines, setting standards for disease surveillance, and advocating disease prevention and control. He contributed greatly in the creation of the national Integrated HIV Behavioral and Serological Surveillance and the monthly HIV/AIDS and ART Registry of the Philippines, which were utilized for planning and developing strategies and interventions to address the HIV problem in the country. Donna Catherine Ortiz (Medical): Dr. Donna Catherine Ortiz is the lead physician of The HIV-AIDS Core Team of Laguna Medical Center. She has been facilitating different healthcare seminars in different areas of Laguna. One of the highlights of her accomplishments is establishing the first-ever treatment hub in CALABARZON, making it easier for PLHIV in that region to access medication. Katerina ‘Doc Kate’ Leyritana (NGO, Medical): A physician for infectious diseases, Dr. Kate is one of the founding Board Directors and the Medical Director of Sustained Health Initiatives of the Philippines, Inc. (SHIP), a one-stop shop alternative treatment option for people living with HIV (and other sexual health diseases). From roughly 30 patients in 2013, SHIP now has more than 800 PLHIV enrollees. Apart from being an HIV physician, she is also an HIV researcher, program developer and policy development advocate. Angelou Marie Estrella (Youth): Together with her university friends, Anjelou started Team Dugong Bughaw, a youth organization for HIV and AIDS awareness that aims to unite local universities/colleges for a stigma-free Iloilo City. In February 2017, Team Dugong Bughaw was awarded as one of the Ten Accomplished Youth Organizations of the Philippines. She is continuously exploring communities related to the HIV advocacy to extend her cause. Elena Felix (PLHIV): Being one of the organizers of the Association of Positive Women Advocates Inc., Elena mentors a new breed of leaders for women living with HIV. Part of her response to the epidemic is actively pushing for amendments in the AIDS Bill by collaborating with the Network to Stop AIDS Philippines. She gives a face to women living with HIV in the Philippines. Roberto Figuracion (NGO): Robert is the HIV Coordinator of the Family Planning Organization of the Philippines-UNICEF in Iloilo, bringing the HIV advocacy to schools and communities within Region VI. The Family Planning Organization of the Philippines has 15 active organizational chapters with 17 community health care clinics nationwide, offering integrated package of essential services on family planning and reproductive health. Jhen Latorre (Influencer): Giving a voice to transgender males in the Philippines, Jhen is one of the founders of the Pioneer Filipino Transmen Movement. He fathered two kids and is a huge influence on various advocacies for the LGBTQI community, especially in his work place. Angelina ‘Angie’ Mead King (Business, Influencer): Angie is a philanthropist and the managing director of Victoria Court, a drive-in hotel that advocates HIV awareness. The hotel also hosted a series of community-based HIV screenings and partnered with leading HIV advocacy groups for their HIV campaigns. Angie also launched the website www.stophiv.info to further raise awareness and created youth engagement activities with focus on HIV. Conrad Oca (Business, NGO): Dr. Oca is the President of the Associated Marine Officers’ and Seamen’s Union of the Philippines (AMOSUP), which endeavors to protect the rights and promote the welfare, health, and wellness of Filipino seafarers and their families. Dr. Oca, with the help of International Transport Workers Federation, addresses the growing numbers of HIV cases among seafarers by supporting Positibong Marino Philippines, Inc., in ensuring equal employment opportunities for PLHIV seafarers and raising awareness on HIV. 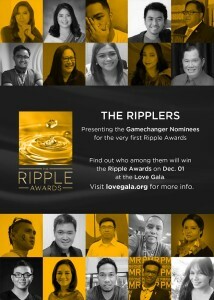 The first-ever Ripple Awards will take place during the Love Gala –Asia’s Premier Charity and Awards event on 1 December 2017 at BGC Arts Center in Taguig City. The Ripple Awards symbolizes how an act of love done by an individual can start ripples that turn into waves of positive change saving millions of people from HIV and AIDS. Apart from the Ripple Awards, Love Gala is the new highlight of the country’s commemoration of the World AIDS Day, wherein donor-guests will also be treated to exclusive performances, a world class fashion show, Filipino artistry, and many more! To take part in this most prestigious event, Love Gala tickets are sold at http://lovegala.org/tickets/. Help fight the growing HIV epidemic as ten percent (10%) of the ticket prices will go to charity. The Love Gala is a collaboration of private and public institutions and youth-oriented organizations to augment the efforts in bringing the HIV-AIDS advocacy to a larger mainstream audience. I read this article completely about the comparison of most recent and earlier technologies, it’s amazing article. As expected high resolution film quality consists of much memory, that’s why it presents improved quality. Please add new movies related to cooking if you have, because I want to learn more and more concerning all recipes of cooking. YouTube includes not simply funny and humorous video lessons but also it consists of learning related video tutorials.